*Apologies for the late Appreciation Post, however, due to being away and other Blog posts that needed to be posted, I decided to save writing this until now. Even though it's late, please be assured that I still want to appreciate and celebrate Tsugunaga Momoko, even after her Graduation from both Hello! Project and the Entertainment Industry. So, whether you like her or not, please celebrate all that Momoko has given us, and say our final goodbyes to her. 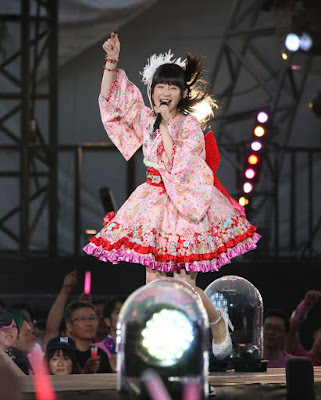 Right here, right now, let's think about only Momochi, and the happiness she delivered to her fans, and everyone else! My original aim for celebrating Momoko's graduation was, of course, to write a bunch of posts about her. I wanted to do about three days' worth of reviews, because whilst there is so much to celebrate about this girl, I had already written about her beforehand. With Berryz Kobou's disbandment (it's not a hiatus) back in 2015, I'd already covered some PV's that included the former Idol. Also, I had written a post where I appreciated her before her graduation. So, there wasn't a lot I could do, anyway, plus I had time constraints. So, I will only be doing this post, and it isn't because Momoko is not important. She is, hence why I'm doing this Appreciation Post (for the second time), even if it is a lot later than expected. I want to share my thoughts on Momoko, where she stands with me, and formally congratulate her in finally graduating this Idol world, and making her way in life as a regular woman, and a fantastic teacher. 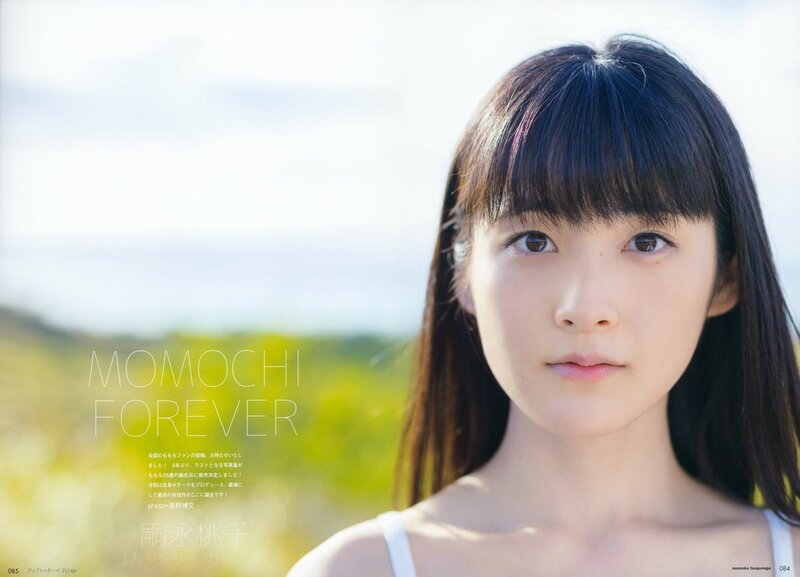 So, without further ado, it's time to celebrate all that is Momochi, in words! For her 15 years of dedication, and her determination to become the perfect Idol, let's thank the wonderful Tsugunaga Momoko, and look back with fondness! Everyone, it's time to be thankful and nostalgic. Let's remember Momochi forever, with fondness, smiles, and horrible pigtails I wish I could chop off! 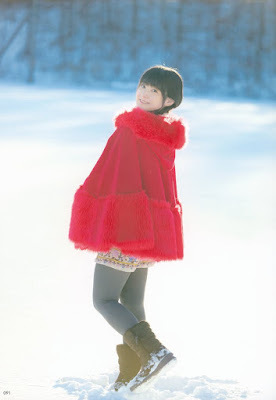 Ever since I cam into this fandom, Tsugunaga Momoko was not what I would call a favourite Idol. More often than not, she kind of annoyed me, though that was mostly Berryz Momoko; Buono! Momoko, I quite enjoyed. She was adorable and weird, a little hilarious, and of course made fun of for her stature and sweet face in some of the PV's (the tricycle in Renai Rider, for one). Momoko is an Idol who has taken on many characters and masks, showing us different sides to her that only enhanced her charm and career. Whether it is the caring, mentor side to Momoko, the pain in our neck Momochi, or the charismatic, cute and energetic Tsugunaga that you have come to know and love, she is someone we remember and know. For well over a decade, she has played various sides of herself, and has been a key role in Hello! Project. I dare to say that, right now, she is one of Hello! Project's most profitable, most popular Idols. Say what you will about her, but the popularity is undeniable. If this wasn't the case, then she wouldn't have had the pull she does, nor would she have secured herself two graduations. One in Country Girls, and the other as a solo Idol, with an outside performance, no less. There is one thing for certain, though; she is everyone's Momoko, and no matter what side of her you loved or wanted to punch, there will always be something about her that draws you in. Whether you love her or loathe her, Tsugunaga Momoko is memorable, and she makes you see her. She is the very epitome of what an Idol should be. There have been so many times where, when watching Momoko as a performer and seeing her in photo shoots, that I have felt confused towards her. Momoko is someone I either like or dislike, there's no in-between; she's just that kind of Idol. Sometimes, she was annoying and over-the-top, but that was her character, and it was a character that paid off in the long-run. Other times, she was downright wonderful, showing off her skills as a performer, proving that she was a worthy leader and mentor for Country Girls, and above all, she revealed that she was also a kind, considerate soul who truly cared for her kouhai and the rest of Hello! Project. Despite all the silliness and over-the-top idiocy, Momoko understood her role as an Idol, and was also a mature, nurturing young woman who loved Hello! Project and its members deeply. For so many, she became an inspiration, and was able to teach others the values of being an Idol, and how to stay on top of their game in order to become recognised within the entertainment industry. I don't think that Country Girls, or any of the other members in younger groups, could have had a better instructor, or a better senior to look up to. Though I am sure that many would have loved to see her graduate for good in 2015, even me, at one point, I'm happy now that she never did. Momoko has brought a lot to H!P since the disbandment of Berryz, and proven her worth even more than I expected. She has done so much for everyone, and not just her fans. Right now, I sing such great praises towards Tsugunaga Momoko, because she deserves them all. This young woman has only continued to impress me, proving me wrong in my dislike towards her during her time as 'Momochi' and not Momoko. Now, I understand why she did it, and I understand well what it has done for her. Momochi, though annoying, is just an extension of Momoko's talents as an Idol, and a wonderful ploy to keep Hello! Project, Berryz Kobou, and herself relevant in Idol society. It was also a wonderful way to employ just how fun and childish Momoko can be, showing off the charms she has, and the skills that she can put forward towards being a teacher. Sure, she was an eyesore at the time, but it attracted the attention of both the fans, outsiders, and children. Tsugunaga Momoko, despite annoying all us Western fans (or, a good chunk of us), did this because she knew that it had the chance to become a hit. It did, and it worked so well for her, and even though she put the pigtails to rest once Berryz left in 20156, she brought them back one last time, showing us one side of Momoko that we remembered, and that we will surely miss. Tsugunaga Momoko, for all her annoying-ness at times, is a genius, too. Like Sayumi's poison tongue and cute shtick, Momoko's own cuteness and insufferable nature became well known and well loved, and it earned her a name in the industry. If she can become so memorable for doing this, then what else can she do? Her talents as an Idol are truly limitless, and I hope that everything she has learned up until this point will aid her in teaching. Aside from being annoying, Momoko is a stellar performer. This is a girl who knows how to own the stage, and take over the fans with her singing, charm and energy. During her graduation performance, I was amazed by the boundless energy this girl had, or how well she sang whilst running up and down the stage. Even if it wasn't a graduation, Momoko knew how to keep your eyes trained on her. She smiles all the time, is always on cue, and never gives up. But, as I have mentioned before, she is also smart. If she wasn't, I don't think she would be as popular as she is, in this world of Idols where AKB is the biggest, and Hello! Project is simply a smidge on the radar. Tsugunaga Momoko knew how to sell herself, and she knew how to stay relevant. But, when it came to the time that she needed to step back, she did just that. With her job as Country Girls' playing manager, Momoko was able to step back and push her fellow members forward, to give them a chance at the spotlight. Even though they played the age card on her, made fun of her in PV's and showed off that somewhat annoying nature we have come to know, Momoko never truly took over. It was their time to shine, not hers, and she graciously accepted it. It's sad to think about, but it has dawned on me that we won't have another mentor like her, aside from Dawa. There's no one who truly knew Hello! Project, like Momoko did. She grew up with it, she watched it change, and she was Hello! Project. I doubt we will come across someone like her again, not in this life time. 15 years have gone by since the day Tsugunaga Momoko became an Idol. Fifteen years of smiles, eccentricities, delight and more. Ever since she came into our lives, whether we have followed her from day one, in the middle, or very recently, this girl has been an Idol adored or loathed by many. She has forged her way into our minds and hearts, showing us all just how memorable she is, and standing out above the rest in this world of Idols and actresses. No matter what we think of her, no matter what we say or how we begrudge her, Tsugunaga Momoko is someone that has stood tall, taken everything that has come at her, and done something even the most popular Idols can't brag about. 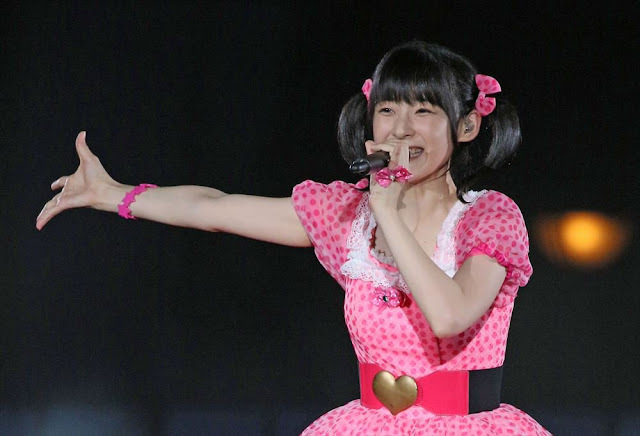 Tsugunaga Momoko is an idol of 15 years, reaching over a decade of being in this industry, and being one of the most well-known Idols out there today. She is known, revered, loved and remembered for everything she has given us, and nothing can change just how amazing she is. Tsugunaga Momoko is an Idol who stands above the rest, even beating out the popularity of Michishige Sayumi and others. If she wasn't so popular, she would not have had the graduation she did, and she would not have graduated as many times as she has, from all the groups that she became a part of, if she wasn't as dedicated or adored as she is. From Berryz Kobou. Buono!. Country Girls, and finally, from Hello! Project. Tsugunaga Momoko is an Idol who has experienced many things, and graduated many groups, but no matter what, she has persevered and shown us her fighting face. Not once did she step down or give in, even when it seemed like times were tough for both Hello! Project and Berryz Kobou. Instead, she stood tall, and showed us all that there was a member worth knowing, and she proved to us all the lengths that an Idol will go to stay relevant and adored. After 15 years, and even after graduating, Tsugunaga Momoko will become the Idol we will all remember. No matter what, she will be Hello! Project's brightest, and she will always be one of their best. She has done so much, and earned the respect and adoration she deserves from fans, members and staff all around, and she will truly be missed. For now and forever, Tsugunaga Momoko is a wonderful Idol, and she will always be our Forever Idol. Thank you for 15 years. Thank you for being memorable. Now, it's time for us fans to let you go, and live with our memories. We will miss you. Bravo, Chiima. Truer words have never been spoken. It took me to time to warm up to Momoko as well (her voice was a bit of an acquired taste for me), but she has done so much throughout these years. Words... kinda fail on my part. I wish Momoko well in the days ahead. Momoko was a gem, once you dug out from under the rocks she piled herself under. Honestly, I'm glad people have warmed to her, or enjoyed her from the get go, or just appreciate who she was, and what she did. She will be a wonderful teacher, if she already isn't. Ah, Momochi! The first time I saw her was in Koinu Dan and Ganbacchae MV. She kind of piqued my interest, but only slightly at that time. Then she turned into "Momochi" with horns haha and I must admit I really loved her in that persona. The way she acted, her routine running gag of being kicked or shunned, and her voice were totally annoying but also laughable, which helped me a lot when I needed to escape my daily hardships. I never liked her songs (please don't eat me! ), whether solo or in group (Ganbacchae as exception) but I used to always make time to watch her in haromoni (God, I'm old!) or reality shows or other shows where I can see her being Momochi. But she grew up and I am really glad that she can pursues her dream. Thank God we have dailymotion and YT! Oh my days, I remember 'Koi nu Dan'! She impressed me with her acting at such a young age, I was surprised she passed off the mature child, and gave a passive look so well! I was so used to the cute and unbearable Momochi, at that point! She really is talented. Honestly, her 'persona' was genius. Annoying, but genius. Nah, don't worry, her singing is an acquired taste, but her personality is definitely A+. That's what attracted people to her, I believe. She had this personality that was undeniably there, and undeniably fun and silly. She was a true character. We will forever remember Momochi through YT and Daulymotion, Veoh and the like! OH MY!